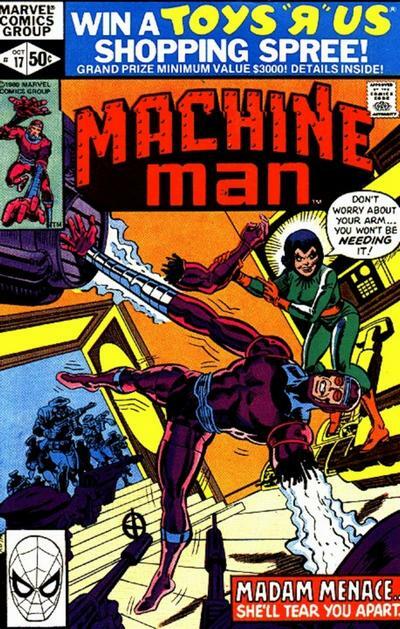 This issue continues the action and intrigue from last issue with Machine Man looking for the arm he lost. Unknown to him, the missing appendage has been sold to an arms dealer by the name of Madame Menace. As he searches, X-51 must also deal with some new and strange feelings coming to the surface with his sudden and inexplicable attraction to his co-worker, Pamela. Can a machine feel love? That is the question that DeFalco and Ditko are starting to explore, thereby turning this book around, and making it more interesting, especially as they have been ramping up the action. In some scenes, Aaron Stack is starting to resemble Christopher Reeve in his Clark Kent persona from Superman, and it is kind of eerie to see it on the page when reading. Altogether though, anything that makes this book better is a good thing. Great stuff all around.